Help your child put on an exciting show and make playtime even more creative with interactive puppets. Have them adventure in the jungle with an exotic tiger, or traipse the plains of Africa with a fierce, wild lion. Go deep sea diving with a plump manatee, or explore an oasis in the Savannah with plush hippos. Perhaps your little one wants to howl at the harvest moon with a beautiful lone wolf or explore the ancient Earth with a vivid green triceratops in a blast from the past. Creativity and imagination come to life with these gorgeous stuffed animal hand puppets. 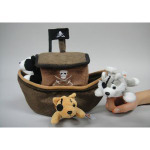 Parents and children can also interact together with a darling tree finger plush puppet playhouse and ride the seven seas with the daring pirate ship finger puppet playhouse. With an array of adorable animal puppets to choose from, give your child a gift that combines fun with interaction and a love of wildlife.